Some very well-known high tech executives are among the 70 per cent of CEOs of high profile companies that shun social media sites, according to a recent study conducted by Augure, a developer of reputation management software. Only 30 per cent of CEOs of top 100 companies traded in the NASDAQ stock exchange are active in social media, according to the firm which studied the online profiles of various executives from January 2012 to November this year. Steve Ballmer, outgoing CEO of Microsoft Corp; Jeff Bezos, founder and CEO of Amazon; Brian Krzanich, new CEO of Intel; and John Chambers, CEO of Cisco Systems, all do not use major social network sites like Facebook, Twitter, LinkedIn, Instagram or Google+ , according to the study. On the other end the spectrum, the Augure study named the top 10 online media influencers among the NASDAQ 100 company CEOs. The first five of that list are: Tim Cook, CEO of Apple Inc.; Elon Musk, CEO of Tesla Motors; Marissa Mayer, CEO of Yahoo; Marc Zuckerberg; founder of Facebook; and Michael Dell, CEO of Dell Inc.
Cook, joined Twitter just a few months ago and has only 22 tweets on his account but has earned in excess of 330,000 followers already. Augure also noted that Apple Inc. itself appears to be social media shy. “Despite being recently named the world’s most valuable company by Forbes, and the largest stock value by PwC, the Apple brand has no official social network presence whatsoever,” wrote Gina Gulberti, communication and content manager for Augure, in a blog post yesterday. She noted that Cook registered 248,000 hits on online media and his official Twitter account and received over 86,000 mentions. By comparison, Robert Kotick, CEO of Activision Blizzard, who was 10th on the Augure list of influencer CEOs, received only 434 hits on online media and 13 mentions on Twitter. Zuckerberg generated the second most online hits at 215,265, followed by Mayer at 107,263. 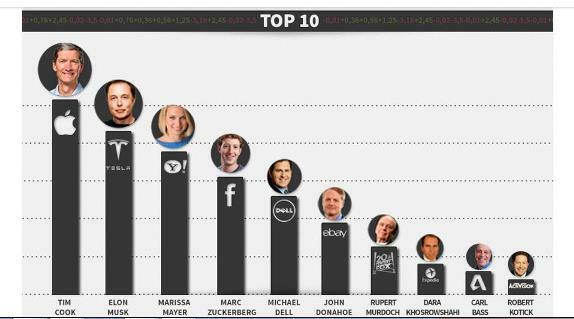 Mayer was the only woman on the list and Larry Page, CEO of Google did not even make it into the Top 10 influencer list. The only active and official social media profile Page had was on Google+. Where do you find these CEOs in the social media sphere?